I do most of my shopping online, but there is a pretty good Target right down the street that I like to pop into for random things or when I feel like I have nothing to wear but don’t want to spend money. For example, last year, I discovered their Universal Thread line and got a few different pairs of shoes for spring. And since then, I’ve noticed the same line has great, affordable clothing basics as well. 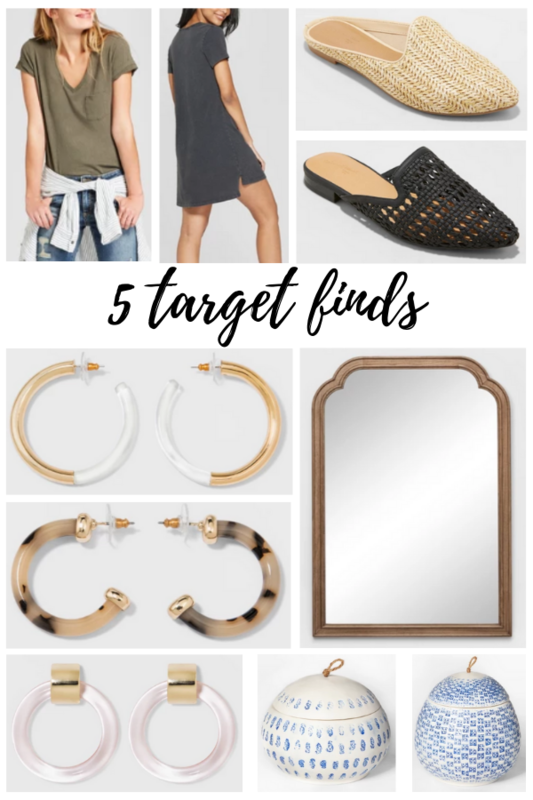 With that, today’s 5 Target Finds include two picks from Universal Thread – slides and an $8 t-shirt that comes in lots of colors and in a t-shirt dress style – along with earrings from Target’s BaubleBar line and a few home decor pieces. 1. Soft t-shirts & t-shirt dresses: My standard spring outfit for both work and play includes jeans and a t-shirt, so I’m always on the hunt for comfortable, good-quality and affordable options. I recently picked up a few simple Madewell t-shirts and tanks from Nordstrom Rack, but then spotted these soft t-shirts on the latest Target run – for $8! The fabric differs slightly on some of the colors/prints – the dark gray and navy were the ones I bought and they are so soft. The t-shirts and dresses also come in plus size. 2. Woven slides: I got these slides (available in cognac & black) last year and got so much wear out of them that this year, I ordered these tan woven slides that are a very light neutral color. I got my regular size, but also would have been fine a 1/2 size up. I also love that the version I have from last year comes in a 2.25 inch block heel. 3. Acrylic hoop earrings: BaubleBar is my go-to for jewelry, especially statement earrings, and I love that Target has the SugarFix by BaubleBar line for even more affordable options. The three acrylic hoops they have now come in a few different colors and are all under $13. This clear and rose-colored 2-pack is only $14 right now! For lots more acrylic earrings, visit this post. 4. Gold mirror: If you keep an eye out, you can find home decor that looks much more expensive than it really is at Target. This gold mirror is definitely one of those finds – it’s under $65 and would be perfect over a mantle or really on any wall. 5. 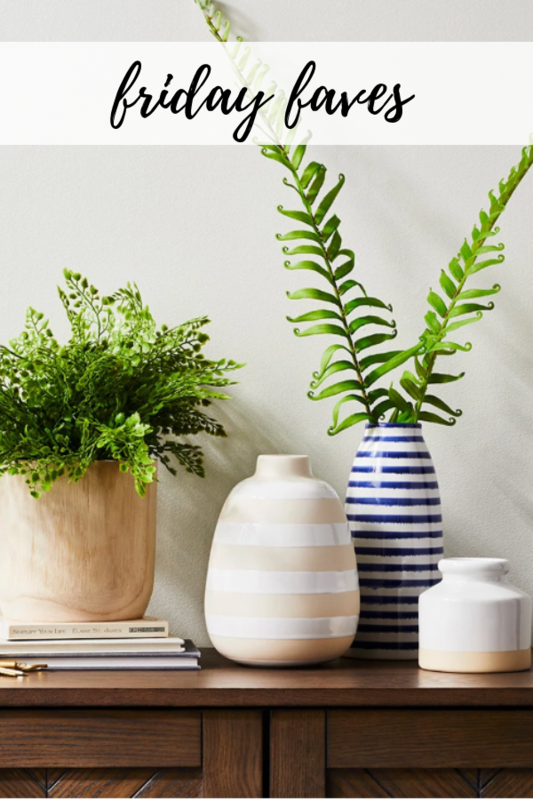 Blue & white vases/jars: I bought a bunch of ginger jars for our mantle recently and now love the added touches of blue in our living room that complement the colorful rug. I’m very into these blue and white vases – would be perfect for flowers on the coffee table or on their own on a shelf. Keeping today’s Friday Faves short & sweet, scroll down to view my latest posts and miscellaneous things I’m loving! I’m a klutz and burned my finger making lunch – work from home problems. Ready to get on the couch and continue my Game of Thrones binge. My husband read an article that said there was time to binge the whole series before the final season (he has always watched, I have been boycotting since 2011) and I gave in and started. We’re starting season 3 tonight! 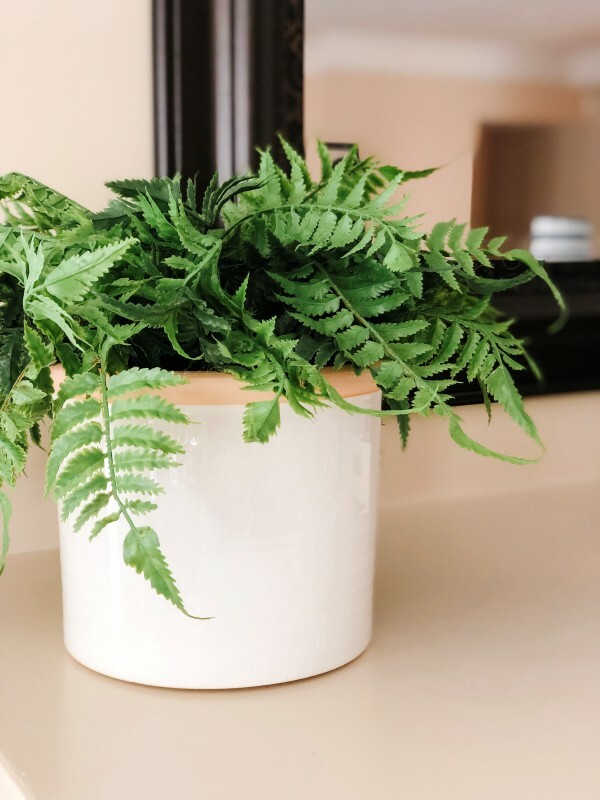 Shop this faux plant here! A case for spending your money where you spend the most time. And another interesting read on why you should stop scheduling your free time. Finally getting AirPods for my birthday – heard good things about this Amazon find for keeping them on during workouts. More Marie Kondo organization tips… video on how to fold miscellaneous items. Want everything in the new Jungalow travel line from Justina Blakeney at Target! The suitcases in particular are so fun. AWAY just came out with a rose gold version of their aluminum “Bigger Carry-On” and I really want it. Love this modern, gold/glass nightstand. It’s basically what I want for my living room coffee table, but for your bedside. Wish we had room for this cute dog bed! Looks like actual furniture… but for pups. Being a total fan girl and bought tickets to The Bachelorette’s Kaitlyn Bristowe live podcast tour. If that’s not for you but you’re a fan of The Bachelor, check out her latest episode with The Bachelor himself, Colton. Got my first Everlane purchase in yesterday and love it so far! This sweater is going to be a go-to – great quality. Heading to the Omni Mount Washington in New Hampshire next weekend and can’t wait! It’s frigid out, so of course that means it’s the start of February. All we’re missing is the gigantic snowstorm that typically hits around my birthday mid-month. But good news: the Pats are in the Super Bowl, so that should make for a nice Sunday Funday. January was off to a great start over here on the blog, but then got a bit derailed toward the end of the month. My new baby nephew came a few weeks early (all good, yay!) and I traveled to Colorado for a friend’s wedding (beautiful! ), followed by a last-minute work trip. I’m ready for some February hibernation and getting back to a routine. Plus the continuation of my KonMari clean-out. Anyway, here are my Friday Faves – links I’ve read, products I’m eyeing and more. What are you loving right now? In my quest for clean beauty, looking to try out a few BeautyCounter products. Which are your favorite? Also listened to an interesting podcast with Miranda Kerr about her Kora Organics line and also need to try it out. Way behind on my yearly photo books and think I need to switch over to Artifact Uprising after seeing this post. My husband sent me this post on how to KonMari your technology as a not-so-subtle hint that my phone has way too many unread emails on it. On a related note, I did use her folding technique as I packed for a trip and it really helped! Watch this video to see how you’re supposed to pack a suitcase. I’ve never used an interior designer but am trying to make updates around the house. If you’re considering working with one, this post on how to get the most out of it will help. Also, has anyone used Havenly? Read about a few female founders and their morning hacks for starting the day off right. Stayed at the cutest boutique hotel in Denver last weekend, The Maven, which is right in the Union Square area with lots of restaurants. More to come on that. Obsessed with home decor at Target right now, including all things blue and white – this striped vase, these flowers/vase and this soy candle. I have them all on display together in this gold tray on my coffee table. Very into this article about Millennials being the burnout generation. I can totally relate. Bachelor fans: loving Kaitlyn and Jason’s new romance, but also felt sad for Shawn on this podcast. Have my eye on this affordable gold ring for everyday wear. Love this Serena and Lily rattan chair – it’s under $100! 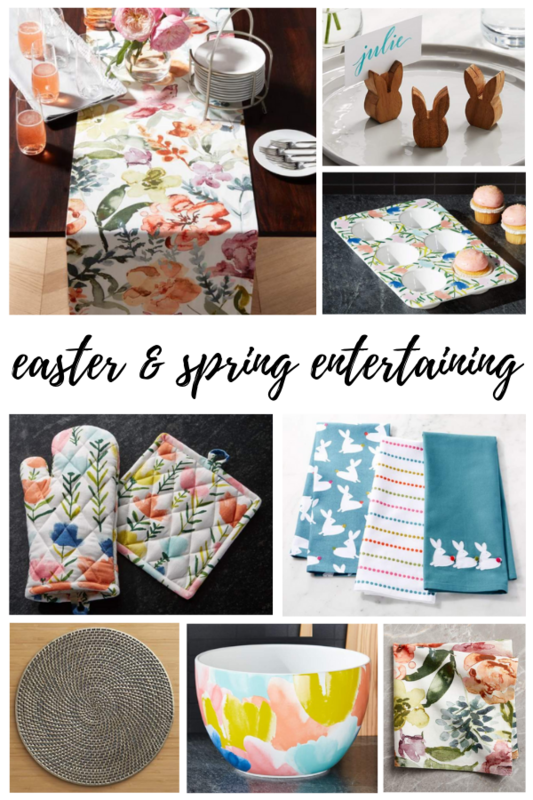 While it certainly doesn’t feel like it, spring is finally here and I’m feeling the urge to make updates around the house. 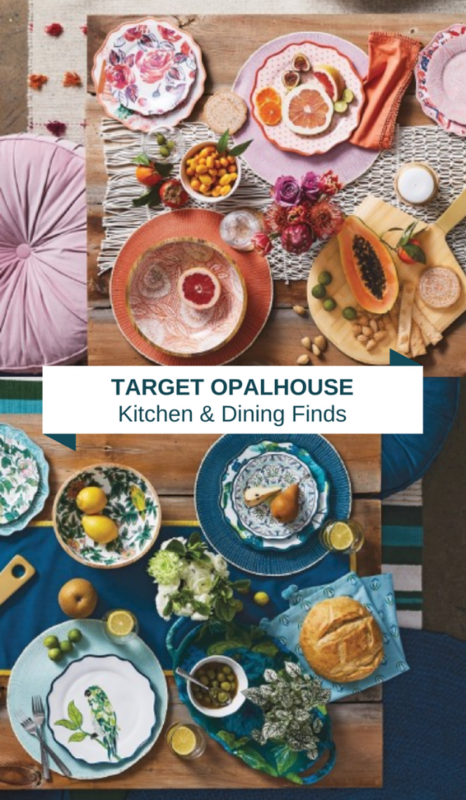 As you may have seen in another recent post, one of the things that sparked me taking action was the launch of the Target Opalhouse collection (more on that here, including all of my picks for every part of your home). 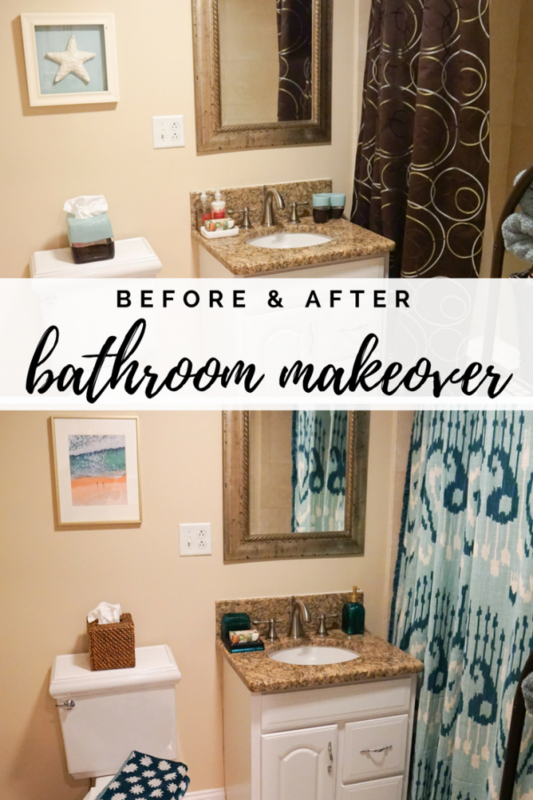 First up: the bathroom I call “mine,” which is technically connected to our spare bedroom, but my husband and I each took one since we have 2 full bathrooms. When we moved, we literally took everything from our 1-bedroom, 1-bath apartment and plopped it into the guest room. Now it’s 8 years later and while we did get new bedding for the spare bed a couple of years ago, the bathroom has remained untouched. I had no idea how much of a difference something as simple as a shower curtain could make. Our old one was brown – I think I was trying to decorate in as gender-neutral of a way as possible! – and it made the bathroom seem so dark when you were actually taking a shower. I always thought it was because the bathroom didn’t have any windows/relatively crappy lighting, but now that I have a light shower curtain, that problem is gone! I also love this one – but ultimately decided to go with more of a blue/green vibe. If you read my 2018 goals post back in January, then you know that my husband and I are approaching 6 years in our city condo and I’m feeling the need for a refresh… but without going crazy cost-wise. In addition to tackling closets and whatnot with organization bit by bit, I had a few ideas for ways to spruce up our space. The first things I’ve been on the hunt for are a new shower curtain/bathroom set for “my” bathroom, coffee table, end tables and throw pillows for the living room, and other fun décor like kitchen towels. I successfully found a couple of throw pillows I liked for the living room but hadn’t had much luck in the other areas until this week. 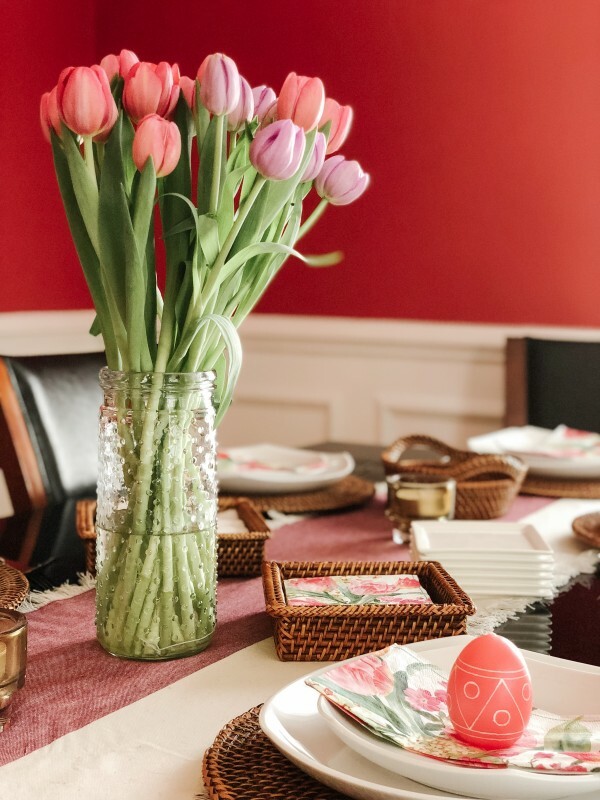 In fact, when I hosted a small group of family over Easter, I ran out to the store to grab some festive floral paper napkins because I felt like we had nothing that said “spring” for the holiday. 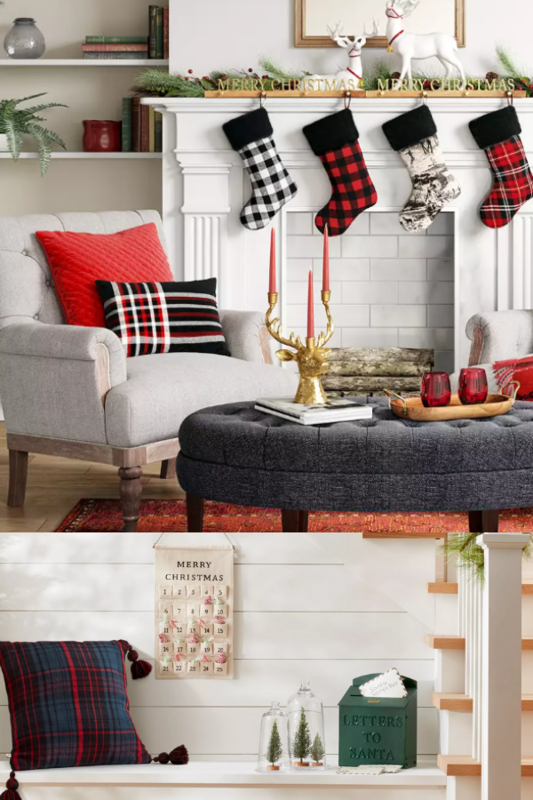 Enter Target’s new Opalhouse collection… I literally want everything! I had a good amount of self-control and stuck with items that were on my priority list, such as this shower curtain, these throw pillows and some floral napkins and kitchen towels. I’ll be reporting back on what works out in future blog/social posts! In the meantime, there is SO much to shop in this collection. It’s quickly gaining so much popularity that I personally think Target should make it a permanent line. I bucketed out my picks from the collection by room/category to make shopping easier. Just browse through the widgets using the arrow and click the items you like to be directed to shop. 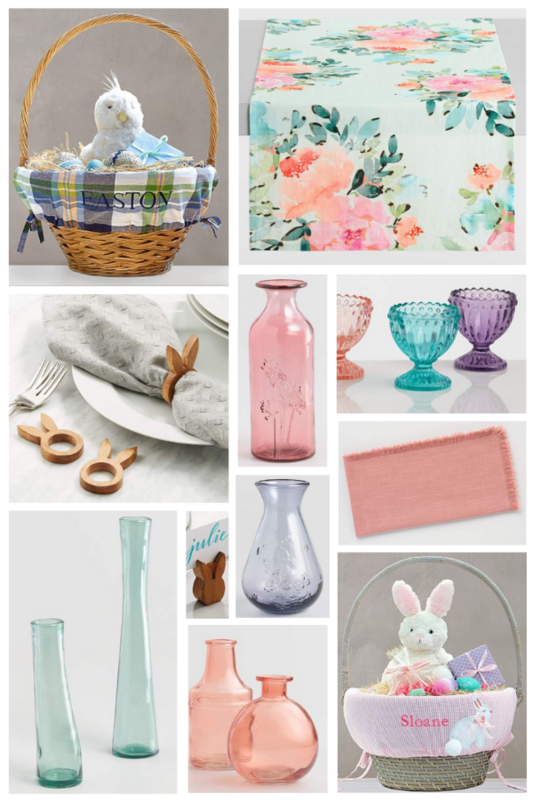 * If you’re not ready to shop, just pin one of the larger images for decor inspiration later! If you’re like me, then you love a good desk accessory. Turns out, with so many in fun colors and patterns now available, they also make for great gifts for coworkers or any friend with a love for desk or home decor. Because really, why wouldn’t someone want to brighten up their work space? 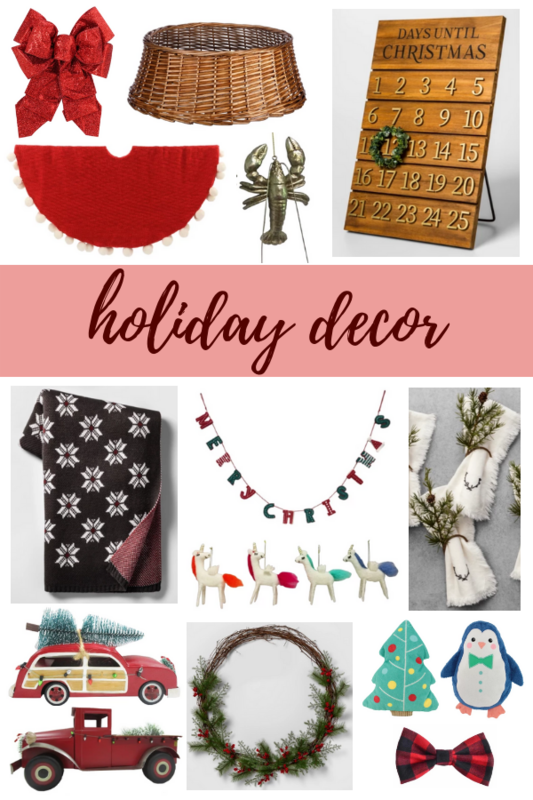 Today I’m sharing lots of great gift options. I personally have a slight obsession with all things pink, gold and white, but I threw in some other fun picks as well to mix things up. As a Chi Omega, I love when I come across anything with an owl on it like these gold push pins (under $4 for the set!). And since I make about 100 to-do lists a day, these dry erase coasters that look like notepads would be perfect for me, along with this to-do list booklet. Shop all of the items shown here using the links below – and feel free to grab some for yourself too! For even more of my picks, follow along on Insta (@dailykatyblog). Just sign up for ShopStyle.it, like my pics and you’ll get a shoppable email delivered right to your inbox. Enjoy!